Super Bird Creations bird toys are recognized by bird enthusiasts as some of the safest available on the market. 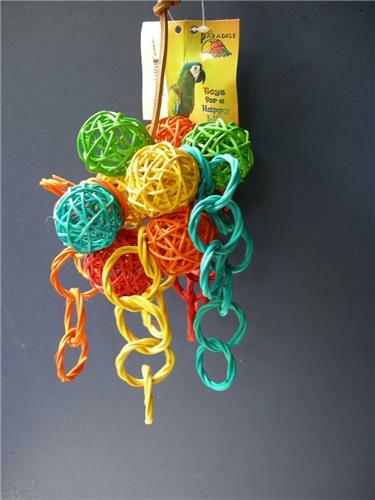 Our product line consists of a variety of innovative products including: bird toys, swings, rope toys, bungees, shower perches, snugglies, foraging toys and bird toy supplies to "Make Your Own Toy" kits and components. Whether you are looking for a toy for a parrotlet or a macaw we have you covered. we had a cockatoo almost strangled had to use sissors cut lose. We recomend stainless steel if available , grade 304 same as 18/8 are also the most common. 316 is marine grade all 300 series OK.
Nickel plated is most common used for toys, and is ok untill the plating starts to erode or flake, put it outside and it will only last a mater of weeks!!!!!! !